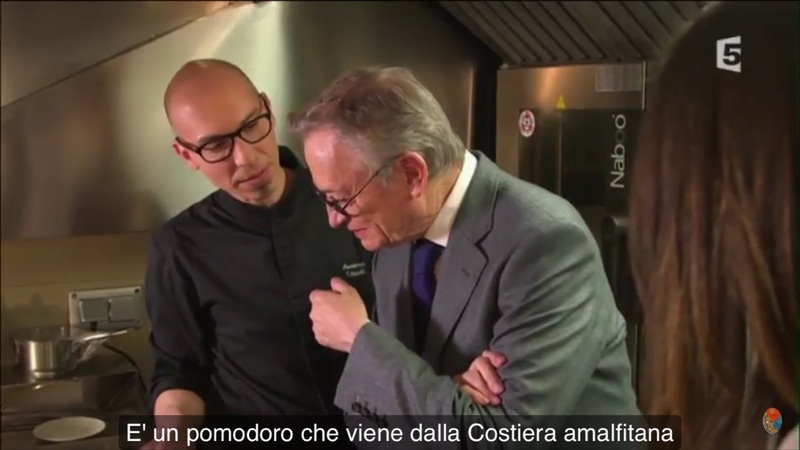 Massimo Tringali, Executive Chef of Emporio Armani Restaurant in Paris (Boulevard Saint-Germain) presents a very special recipe made with our ancient tomato on the famous French TV show on France 5 “Les Escapades de Petitrenaud“, hosted by famous gastronomic critic Jean-Luc Petitrenaud. The recipe showed by the Sicilian chef is hand made ravioli with stuffed with burrata and laid down on Re Fiascone sauce. “The tomato coming from the Amalfi Coast – Tringali explains in front of France 5’s cameras – has a very nice scent, it is very rare and hard to find, and form me it is something extraordinary”.